Here at Union Room we’ve started 2016 with a flurry of new projects, new sites and new clients. We have big plans for this coming year and for us that all begins the first day back at work in January. You’ll be hearing more about all that in the coming months but for now let’s turn focus to site launches, and in particular our newest case study site for Pearson Engineering. 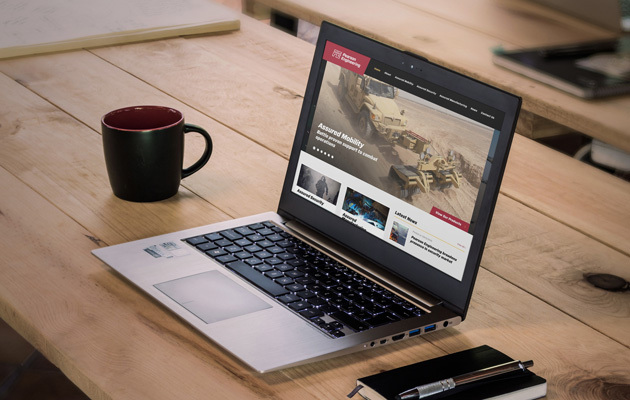 As a global leader in combat engineering systems, Pearson Engineering required a website that has the ability to present both the traditional combat engineering systems that they are renowned for, whilst also showcasing the new Assured Manufacturing and Assured Security business streams in an effective way. The company has seen significant growth over the last few years and, to best display and capitalise on this, their online presence needs to continue to reflect that progression. We have responded by creating a site which features both of these sides to the company as part of the main navigation. We’ve given prominence to the drone footage of the iconic Armstrong Works in Newcastle, where Pearson Engineering have recently relocated to, and updated the font to match the offline print material. We’ve also worked to incorporate complementary new colour schemes to show the difference between the two new businesses streams. The improved website has already shown an increase in traffic and enquiries, and we look forward to working closely with Pearson Engineering on further digital developments in the future. For further details on the brief and our solution see the case study. If you’d like to team up with us in 2016 and perhaps start the new year off with a new website design to match, give us a call or drop us an email. We’d be happy to work with you.